X-rays and probing with an explorer are limited in detecting sub surface decay, particularly when the cavity is in its early stages. Fortunately, the DIAGNOdent® is a major breakthrough that allows the dentist to monitor the areas below the hard surfaces. The DIAGNOdent® allows the dentist and hygienist to locate hidden decay, and with treatment stop the spread of disease before it destroys the tooth from within. 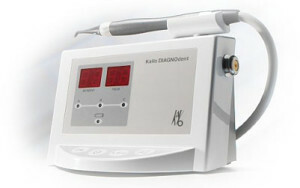 It is an Accurate and Reliable cavity detection aid. Ask about this painless and accurate laser cavity detection at your next visit.